In this Monday, May 14, 2018 photo, betting odds are displayed on a board in the sports book at the South Point hotel and casino in Las Vegas. Full-scale sports betting will begin at 1:30 p.m. Tuesday at Delaware's three casinos, officials said Thursday. The offerings will include single-game and championship wagering on professional baseball, football, hockey, basketball, soccer, golf and auto racing. "Obviously the key is going to be the football season because the bulk of betting in America is on football," state Finance Secretary Rick Geisenberger said Thursday. "We'll learn a little bit in June and July, but we'll learn a lot more in September." In 2009, lawmakers authorized the state lottery office to promulgate regulations for betting on any professional or collegiate sporting event, except for games involving Delaware colleges or universities. A federal appeals court shot down the state's plan, however. It said Delaware was restricted in its grandfathered status under the federal ban to offering multi-game parlay bets on National Football League games. While the attempt to expand sports betting failed, the 2009 legislation and the state's experience offering NFL parlay betting over the past several years meant the infrastructure for full-scale betting was already in place. 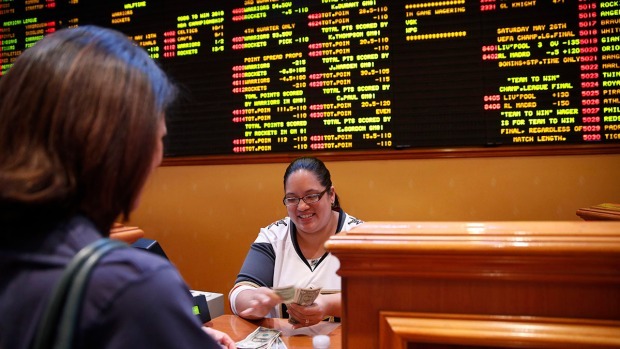 "We've had sport betting for nine years, so it's not new to us," state lottery director Vernon Kirk said Thursday after officials completed live testing on the new system. "We're not surprised the software works because it's been working fine," Kirk said. "We didn't have to make any significant changes." For the time being, bettors will have to make wagers in person at a casino, but officials are working on a mobile application that will eventually allow someone who is "geolocated," or physically present, in Delaware to place bets on a smartphone. "We certainly think that's the future of sports betting," said Kirk, adding that the launch of any mobile application is at least several months away. Meanwhile, it's unclear whether sports betting will pay off for Delaware. The existing sports lottery has taken in about $46 million in wagers annually over the past two years, with an average net of about 25 percent. After the oddsmaker takes its cut, the state takes half the remainder, with about 40 percent going to the casinos. The state's horse racing industry also gets a percentage. The state's final profit amounted to about $2.2 million in fiscal 2017 and $9 million in fiscal 2018. The same revenue-sharing scheme will be used for the new sports betting system, with the state, casinos and horse industry sharing what's left over after the winners are paid and Scientific Games, the state's primary sports betting contractor, takes its first cut of 15.6 percent of the remainder. "You need a lot more gaming in order to generate the same amount of revenue," he said.